And we always like to go to at least one higher-end restaurant every time we visit London. 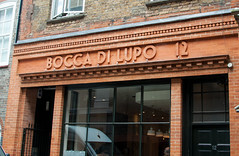 This time, my brother picked Bocca di Lupo ("Mouth of the Wolf") in Soho, with a lunch reservation (since it turned out that, six weeks out, a reasonable dinner reservation for four was difficult) for lunch. 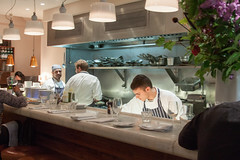 In any case, Bocca is regarded as one of London’s best Italian Restaurants, despite the issues in getting a seat (although the brave and the individual traveler should note that Bocca di Lupo’s bar overlooking the kitchen is reserved for walk-ins). It’s also one of the places that seems to be embracing the open kitchen concept. While that concept has been raging in the US for several years, it doesn’t seem to be nearly as common in the UK, but at Bocca you can see most of the cooking happening mere feet from some of the diners at the bar (not always to ones’ benefit, since at one point someone working the line obviously burnt some onions). And the space is rather open as well, with a nice modern feel. The downside is that it’s a rather small place (about 8 tables in back aside from the bar) as well. As a counterpoint to the fairly modern and trendy feel, however, the menu itself is classic Italian, bordering on rustic at times (another niche that is somewhat underserved in London. There are a lot of nominally Italian places, and several particularly good ones, but they are somewhat more sparse, especially for someone like myself used to Boston where you can’t swing a Chianti bottle without breaking the window on two Italian places). It’s really a good selection of nice Italian dishes broken up into small courses, with crudi, fritti, pasta, and meat courses. And amongst our table, we ordered up a rather nice selection. 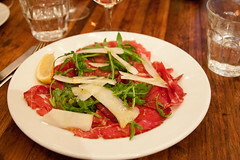 My dinner started out with a beef carpaccio, and this was your classic rendition done with some attention to detail. The beef was nicely marbled and thin, and not overly cold. It was topped with a nicely dressed arugula salad with some flavorful parmesan cheese blocks on it. Nothing out of the ordinary here, but a particular good execution. 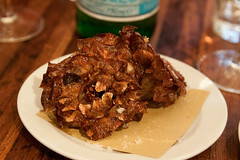 Next up was a pair of fried artichokes, and these were also particularly nicely done. The artichokes themselves were smaller young artichokes, with soft hearts and particularly soft leaves, that fried up nicely with the softer breading. About the only issue here: these artichokes did seriously soak up the oil, so this ended up being more than a litle bit of a grease bomb. But a tasty one at that. 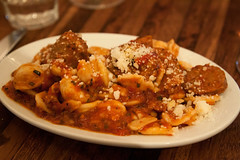 For my main course, I opted for the orecchiette with ragù and Italian sausage. This is about as standard old-school Italian as dishes come, but it’s always one of my favorites when done well: the combination of a a good toothsome orecchiette in a rich meat ragù is what a good pasta should be, and this really delivered, with one of the richest ragù sauces I’ve had in a while. Combine that with some perfectly done highly-spied Italian sausages, and this was pretty much the perfect pasta dish. I’d come back for this. 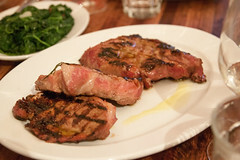 We rounded out the meal with some pork necks with honey and rosemary. These were the perfect expression of simplicity: just several slabs of roasted pork neck on a plate, with a light honey and rosemary sauce that complemented instead of covered the nice flavors of the pork. We opted to skip dessert, not because of any shortcomings on the menu, but because Gelupo, a great gelato shop owned by the same owners of Bocca di Lupo, is across the street. Overall, we rather enjoyed Bocca di Lupo, and had a rich and flavorful dinner of authentic Italian food done quite nicely. While a bit of a challenge to get into, I’d probably try my luck sometime at the walk-in seating at the counter.